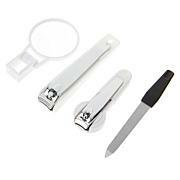 Glass nail files handcrafted by expert artisans in the Czech Republic, which is renowned for high-quality glass. Use the abrasive side to file thicker nails, shape nails and to exfoliate dry skin. 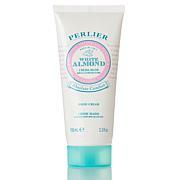 Use the finer side for smoothing nails and skin. Pointed tip is used for the cuticle and for cleaning underneath the nail. Use the pedicure file on clean, dampened skin free of any oils or moisturizers. Files can be used wet or dry and can be used to file in both directions. To clean, rinse files under hot running water after use. Use a soft brush with soap or antibacterial disinfectant for deeper cleaning. Lay files on a flat surface to dry. Always store files in their protective velvet sheaths when not in use. These files are made of glass and can break if dropped or misused. Broken files should be discarded and not used. The filing surfaces will not wear down or wear out. Well-maintained and cared for, these files are long-lasting. This is the first file I was able to use on my very thick toenails. These files are sturdy and mean business --- be careful not to over-file. Wash each time you use them --- I use an old toothbrush & liquid soap, then dry with towel. I got one for myself and one for my husband, and it clear the rough place under the foot very well. 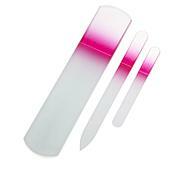 This set of nail files works great on nails and feet. Like them so much I bought a set for my mother. A great buy!! I have purchased something like this product at an art fair; however this one is superior. It does not tear your nail and the large one works like a dream on your feet and even dried out skin on your legs! Love all three sizes. Small one fits great in your purse for on the go. Work well and pretty to look at. 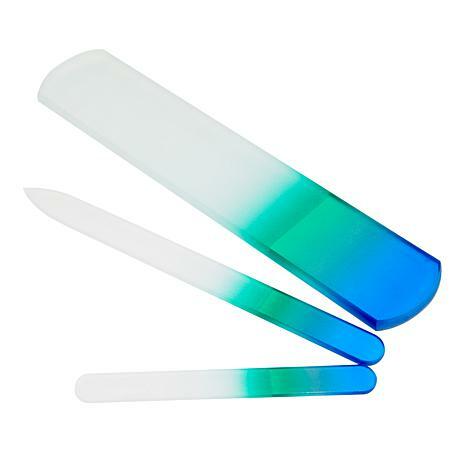 Good quality nail files. Love the various sizes.